Fairy Princess Skye lives among the butterflies... she is so happy that she "let's it all hang out"! She loves to perch on her blue Fenton glass butterfly and treetrunk. Skye wears as little as possible (blush!) but her wings are hand-made, hand-painted fantasy butterfly wings. 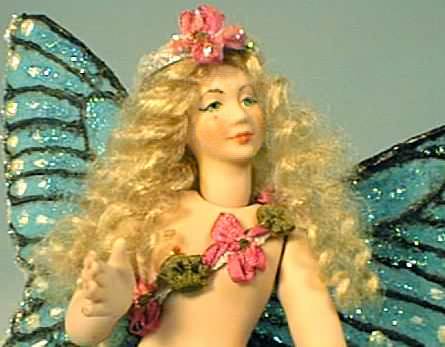 She is an all-porcelain 4" doll with a 4" wingspan. 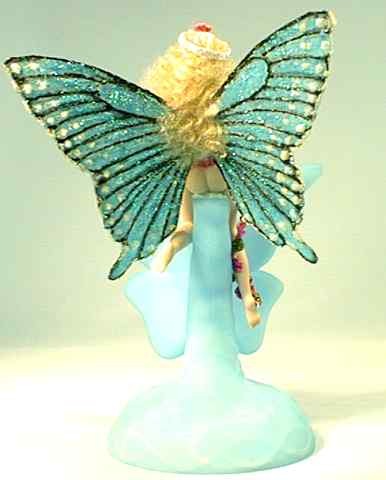 Her blue glass butterfly is 4" tall, with a 4" wingspan. She is a beautiful, one of a kind work of art by the artist JoAnnJ of Galleria d'Juliani, and is hand signed by the artist. Let her light up your home!